The breakwater that spans across from the end of Cape Cod’s hook across the Bay to the little spit of land known as Long Point has been in place as long as anyone can remember. 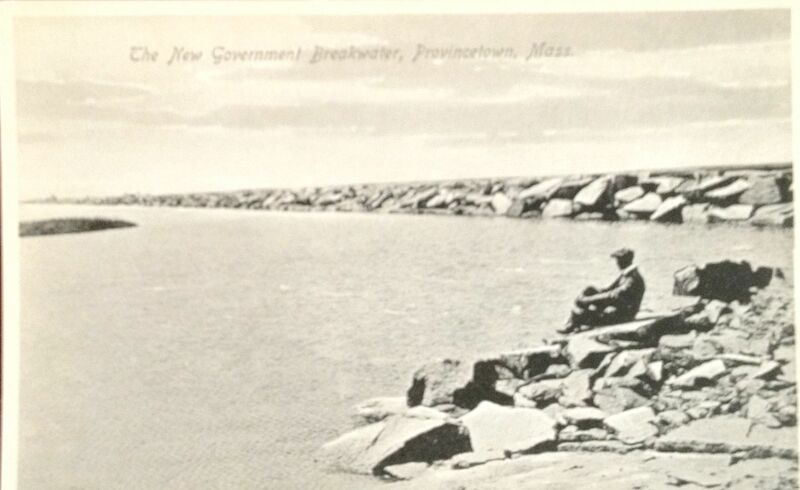 But there was a time when it was referred to as “The New Government Breakwater” as it is on this postcard. Walk across the breakwater and you’ll arrive at Long Point and the Long Point Lighthouse. Built by the Arm Corp of Engineers and completed in 1911, the intent of the breakwater was to secure the safety of the harbor and prevent the erosion of sand. Take a walk on the breakwater and arrive at the Long Point Lighthouse or practice your skills climbing the rocks. It used to be a great place to gather mussels to steam for dinner, along with hermit crabs and starfish. Still the sand around the breakwater moves and splits as the decades pass. Life changes . People die. Others leave and new residents arrive and decide to remain in Provincetown. Thus the name of the novel Remaining in Provincetown, a mystery not only about a murder but about the town itself.